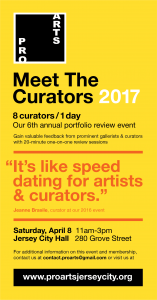 Meet the Curators is a yearly event featuring the opportunity for visual artists to meet professional curators for 20 minute one-on-one discussions regarding their work and careers as professional artists. The yearly Curator’s Choice Exhibit is a selection by the curators of the best portfolios reviewed during the event. What do curators look for when selecting artists? How does a visual artist get their foot in the door when approaching galleries? How can an artist present work that stands out in a competitive market? Pro Arts Jersey City has long encouraged artistic excellence and a strong local community. Meet the Curator presents an opportunity to connect with industry professionals and gain constructive insight on their work in a supportive environment.